Three Ecological Sensitive Zones (ESZ) viz. ESZ-1, ESZ-2 and ESZ-3, with varying degrees of protection. These are outside the existing protected areas. Divide the entire Western Ghats ESA into 2200 grids and each grid assigned ESZ on the basis of composite scores of ecological significance derived from the database generated by WGEEP. Since Western Ghats is spread in six states, treat Western Ghats regions of each state separately. Final demarcation of the ESZs and the final regulatory regime should be based on extensive inputs from local communities and local bodies viz. Gram Panchayats, Taluk Panchayats, Zill Parishats, and Nagar Palikas, under the overall supervision of a Western Ghats Ecology Authority (WGEA), State level Ecology Authorities and the District Ecology Committees. A Western Ghats Ecology Authority (WGEA) should be established as a statutory authority appointed by the Ministry of Environment and Forest, GOI under Environment (Protection) Act 1986 to focus on promoting transparency, openness and participation in every way for development and sustainability of these areas. Continuation of existing mining in ESZ-2 under strict regulation with an effective system of social audit. In ESA-1 and ESA-2, no new red and orange category industries should be allowed. Development plans should not be cast in a rigid framework, but ought to be tailored to prevalent locality and time specific conditions with full participation of local communities; a process that has been termed adaptive co-management. The above description makes it clear that Gadgil panel recommended something which was indigestible to politicians and businesses although it was supported by ecologists. The report was first not released in public by central government and once it appeared in public domain, it was also criticized by states where the mountain range stretches along with politicians and farmers’ organisations that feared it would hamper development. The major criticism faced by Gadgil Committee report was that it was more environment-friendly and not in tune with the ground realities. Recommendations were cited as impractical to implement. Gadgil report has asked for a complete eco-sensitive cover for the Western Ghats which hamper different states on energy and development fronts. There was a criticism against the constitution of a new body called WGEA. States insist that protection can be given under existing laws. Gadgil report doesn’t give a solution for revenue losses due to the implementation of its recommendations. 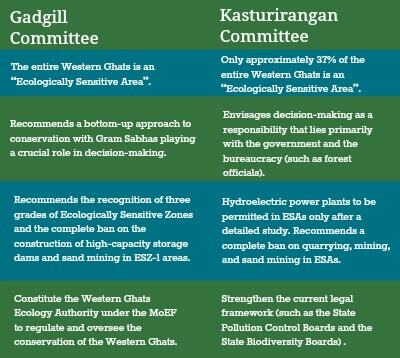 Gadgil report is against dams in the Western Ghats, which is a crucial blow on the ailing power sector. Considering the growing energy needs of India, critics argue that this recommendation cannot be taken. And the most important: The Gadgil Committee report adversely affects the various mafia 🙂 . When the Gadgil Committee report was first made public, there were a lot of protests against it from the sand mining and quarrying lobbies in Goa. Many mafias created fear among farmers in Kerala that the Gadgil report is against them, and that they will lose livelihood if its recommendations are implemented. As said earlier, the Kasturirangan committee was constituted to examine the WGEEP report. The committee is often called HLWG – it denotes the 10 member high-level working group (HLWG), headed by Kasturirangan. 41 per cent of the Western Ghats is “natural landscape”, having low population impact and rich biodiversity. Thus, instead of declaring entire Western Ghats as ESA, the panel said that 90 per cent of the “natural landscape” should be protected. The identification of ESA was based on the fragmentation of the forests, population density of villages and the richness of the biodiversity in villages. This would be around 60,000 Km² ecologically sensitive area spread over six states. Thus, it diluted the protection of 137000 Km² areas as stipulated in the Gadgil report. This implies that according to Kasturirangan committee, around 37.5 % of the total area of the Western Ghats is ecologically sensitive. Supervising forests and bettering their productivity to ascertain inclusive growth and economical gains for local communities. The committee recommended removing the cash crop plantations such as rubber, agricultural fields and settlements should be from the protection regime. Encouraging ecotourism for local benefits. A ban on all polluting industries (including mining) categorised as most hazardous in the Water (Prevention and Control of Pollution) Act, 1974, and Air (Prevention and Control of Pollution) Act, 1981. The Forest Rights Act, 2006, that recognises the rights of dwellers on forest resources, will be implemented in letter and spirit and the consent of Gram Sabhas concerned will be mandatory for any project. Strict regime for Hydro-power projects. These include cumulative impact assessment of such projects and ensuring minimum water flow in the rivers in the lean season. Set up a body to assess and report on the ecology of the region and to support the implementation of ESA to be set up. The Kasturirangan report recommended ban on mining, quarrying, thermal power plants and highly polluting industries within 60,000 sq km of the Ghats. Projects will be allowed only after the approval of the gram Sabhas concerned. The Kasturirangan panel used remote sensing and aerial survey methods for zonal demarcation of land in the Western Ghats. The usage of such techniques, without examining the ground reality, has caused many errors in the report. The power is vested with the bureaucrats and forest officials and not with gram sabhas. Many fear that the farmers would get evicted if the Kasturirangan Committee report is implemented. Under this report, the mining and quarrying lobbies are expected to flourish. When these lobbies and tourism flourish, it will be disastrous for the environment. There will be a water shortage, there will be pollution. Finally, farmers will have to quit the area. They will not be able to do farming there. The use of “erroneous method” had caused inclusion of many villages under Ecologically Sensitive Areas (ESA) though there were only rubber plantations and no forest land! Kasturirangan report included ecologically non-sensitive areas under ESA, and left out many ecologically sensitive areas! Previous postShould the Office of Governor be scrapped?